Today is the second day of my Christopher Plummer Movie Blogathon, celebrating the work and films of the wonderful Canadian character actor who’s given us so many roles over the past 60 years, from Sherlock Holmes and Leo Tolstoy to a musical Austrian navy captain and Captain Kirk’s nemesis in a Star Trek film. Here’s what’s been happening on the various participating blogs. Brief Synopsis – After a bank teller foils a robbery, he decides to take the money himself which gets him into trouble with the robber who wants his mobey back. My Take on it – I had never even heard of this film until recently and was very pleased with everything it has to offer us. Elliott Gould and Christopher Plummer are both excellent as the leads and it was so refreshing to meet two very intelligent characters playing cat and mouse with each other. You never really know what will happen as they each get deeper and deeper involved in the crime. The character of Muntz is clearly modeled on the movie star adventurers of the 1930s and 1940s, i.e. Errol Flynn, Clark Gable, Douglas Fairbanks Jr., Tyrone Power, etc. He is a “surprise” villain, in the sense that the main characters are initially unaware of his capacity for cruelty and crime. In fact, I would say that Muntz is the most heinous of the Pixar villains, possibly one of the most heinous of the Disney villains as a whole. Perhaps it seems that way because he’s not a magical figure, but an ordinary man. He’s willing to kill and destroy over an obsession that the rest of the world forgot about long ago. Who better to voice Muntz than the urbane Christopher Plummer? One could imagine him playing a character just like him in a live action film when he was a young man. Plummer has always been the kind of actor who could easily slip into heroic or villainous roles, and in this film, he voices a character who embodies both. Great blogs from everyone! Keep them coming. The header image and other images in this article are presumably copyrighted by the owners of the pictures involved (Disney/Pixar in the case of Up and Carolco Pictures in the case of The Silent Partner). 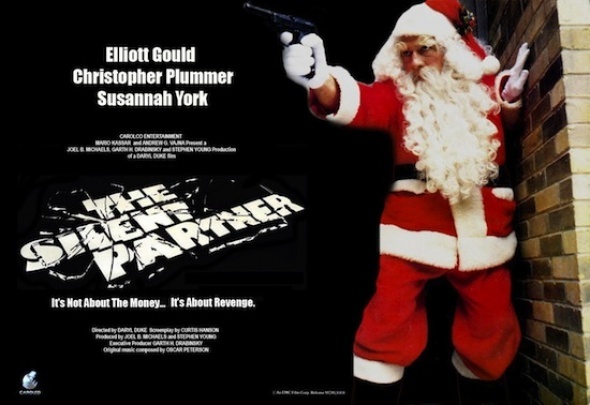 The header image is a still from The Silent Partner. I believe my inclusion of them here is permissible under fair use. He’s a good actor, but an awful snob.